“Desire After Dark” is a New York Times Bestseller! Congratulations to Marie Force! 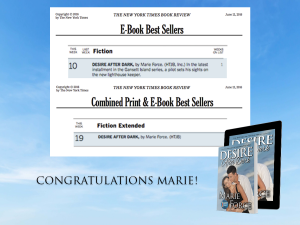 Desire After Dark debuted at #10 on the New York Times E-Book Best Seller list and #19 on the New York Times Combined Print & E-Book Best Seller list! Fashion designer Whitney Port talks about the 10 year anniversary of “The Hills,” reality stardom and more during during an Interactive Media Tour with TooFab.com! “Everywhere and Every Way” Available Now! Get Down. Get Ready. Get Probst Now! Kat Graham IMT with Hollywire! “The Vampire Diaries” actress Kat Graham talks about the latest news from “The Vampire Diaries” and her partnership with Caress during an Interactive Media Tour with Hollywire.com! Watch: Exclusive: Kat Graham Calls Caress Partnership a “Dream Come True” & Talks Vampire Diaries!